Gen Con had one major release that had me all excited. It was a science fantasy game which I had heard so much about at the last Gen Con that I was chomping at the bit to get my hands on it. As more information came out, I was getting more and more excited to get the game and get to playing it. This year, my plans for Gen Con had been in flux for some time. It took until close to the end of May for things to solidify that I would be attending the show for more than one day. This state of flux meant that I would not be able to get up to the convention on Wednesday. It was not until Thursday afternoon at around 3:30 that I was able to make my way into the Gen Con vendor Hall and make a beeline for the Paizo Booth. When I arrived, I was to discover that the giant pile of books that I had seen on Twitter for Starfinder had been decimated. There were no more core books to be had. I was, needless to say, a bit disappointed. I was glad that the game was so popular but I still wished that I had been able to get my hands on a copy. Luckily, I had an appointment scheduled too speak with the developer of the game on Friday at 4:30 pm with Jason Keeley. Jason stated that Paizo had brought to this Gen Con 50% more books than they had ever sold for a book at any prior show. The thought had been that they would still sell out by the end of the show on Sunday. They did not expect to sell out of all the books they brought within the first few hours of the convention. Jason stated that the book would most likely be going to a second printing soon. Jason went on to state that he believed that demand for Starfinder might be attributable to a few things. He believed that the good press and hype that the book had been receiving over the past year had really primed the pump for the book. He went further to state that the hobby itself had a dearth of science fantasy games that are not tied to a specific Intellectual property. He pointed out that Starfinder provides a toolbox that allows a group to emulate most of the science fiction tropes with ease. These things combined to create a perfect storm for this convention. One of the questions that I always have in regards to science fiction games that rely heavily on exploration is the idea of a planet builder. I asked Jason if there was such a thing included in Starfinder. He stated that there were rules for generating planets. These include some charts for environments and such, but no designated planet building section. He did not rule out a future supplement that would do just such a thing, but did say it was not on the schedule currently. One of the things that I had always noticed about Pathfinder is that the storyline was never fully integrated into the rules. The Adventure Paths are where the setting would shine while the rules were a toolbox left to the players imagination. I asked Jason about this and Starfinder. Mr. Keeley stated that Starfinder was a bit of departure for Paizo in this respect. The setting material was much more integrated into the main book. It provides it’s own hooks for the game to move forward without issue. This can be found in the races, snapshots of planets, and the legacy integration of the fantasy races into the game. This flowed easily into my next question. “What stands out in Starfinder to make it feel like a science fantasy game as opposed to just a few extra bits of set-dressing for Pathfinder?” Jason mused on this for a moment and then said that there were two things that stood out for him. First were the Starships. He went on to say that the game begins with the presupposition that the group starts with one. The starship design rules stand out as they not only allow the players to create a ship that fits their needs at the beginning of the game but allows them to keep the same ship while upgrading it easily throughout the levels of the game. Jason pointed out that one of the major tropes of science fiction is that the ship never changes. This would be difficult in Starfinder as the character will continue to get more powerful and need a better ship at certain points. This design systems allows the characters to have a ship similar to shows from Farscape and Firefly and still allow it to keep up power-wise. Jason also believes that the character classes and themes carry a lot of weight for Starfinder. These two things seem somewhat simplistic but allow for the creation of characters that cover all of the tropes of Science Fantasy outside of the Doctor himself. You are able to create an analog to Spock to Obi Wan Kenobi with ease and still have the flexibility to create anything that your heart desires within the Starfinder system. Further discussion with Mr. Keeley revealed that Starships were both his favorite part of Starfinder and one of the things he found most challenging. JAson loves the starship combat system. The hex grid system makes it easy to understand how the fight plays out for starships of different styles. The rules are clean and simple with an ease of use that he found lacking in previous science fiction games. Making this happen was the difficult part as he wanted the game to be easily picked up by new people and the starship combat rules to not be so daunting that they would never be used. Jason stated that it was a design problem that he and the team wrestled with and are very happy with what they have created for Starfinder. I asked Jason what was something about Starfinder that people might miss that he thought were worth noting. He took a moment to think on this and then stated that it were small changes that he loved that would go unnoticed. In particular he spoke of magic in Starfinder. He mentioned that people wondered if Magic Missile was in the game. He stated that it was but that there was a mechanical change that made the spell still iconic without being as overpowering as it can be in prior iterations of the spell. He also mentioned a change to Cone of Cold. He spoke of how instead of being a blast of just pure arctic cold, it was more of a heat sink. It allowed for certain classes to then store the heat stolen by the spell to be used to power spells at some later point in the game. It was small tweaks like these that gave Starfinder that Science Fantasy flavor but that they are easily overlooked when you have starships and space stations to play with now. It was great to get to speak with Jason at Gen Con. 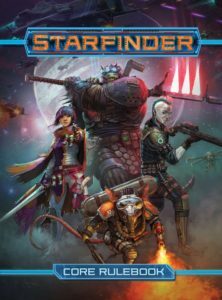 It helped me get a better understanding of what to expect when I would be able to get my hands on a copy of Starfinder. It is a game that embraces the big ideas of Science Fantasy with starships and light swords but does not neglect the details. Every piece was designed to create the look and feel of a space opera and allow one’s imagination to soar amongst the stars. I can not wait to get my copy of Starfinder.